On January 4, 2016, transcosmos inc. (Headquarters: Tokyo, Japan; President and COO: Masataka Okuda; TSE First Section: 9715; hereafter, transcosmos) has opened its own store “transcosmos Overseas Flagship Store” (URL:http://www.kjt.com/Store/4175) within “KJT.com,” a cross-border E-Commerce website for the Chinese market operated by Shanghai Kuajingtong International Company Limited (Headquarters: Shanghai, China; President and CEO: Mao Wei). As part of the global E-Commerce one-stop service provided by transcosmos, it would offer attractive products from Japan to the Chinese consumers, utilizing an over-the-border E-commerce, and deliver by international delivery. In China, along with the spread of the Internet consumer practice, the amount of total purchase by the consumers has increased, and the consumer needs to seek more secure and safer products are on the increase. The total amount of product purchase from Japan in the Chinese domestic market exceeds 600 billion yen, and the cross-border E-Commerce market in China is expected to grow to the 1.4 trillion yen scale by 2018. (Sources: Establishment of the Base Pertaining to Information and Services of Our Country’s Economic Society, 2014) On the other hand, in the area of sales through cross-border E-commerce, the reality at present is that there are quite a few challenges in terms of language barrier, tariffs, logistics, and customs. “KJT.com” is a cross-border E-Commerce marketplace established by the City of Shanghai and Orient Electronic Payment Co., Ltd., an electronic payment systems company, and is rapidly growing. Also, “KJT.com” promotes E-Commerce marketplace in accordance with the cross-border E-Commerce platform measures led by the Chinese government (customs authorities) and establishes the pre-payment system for the tariffs and the base for international distribution to China. transcosmos has opened “transcosmos Overseas Flagship Store” within “KJT.com” for sales of high-quality Japanese products, and at the same time, through this strategic partnership with “KJT.com,” cooperation in the areas of platform and logistics would bring into reality more seamless international business transactions and distribution. 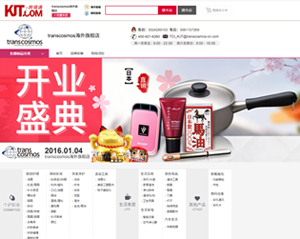 “transcosmos Overseas Flagship Store” provides an opportunity to introduce the Chinese consumers to the high-quality products and life style from Japan they seek. We strive to become a friendly store where “secure and safe”, “high-quality,” and “functional” products can be easily purchased from Japan. “KJT.com” has distribution sites in The Shanghai Free Trade Zone (SFTZ), setting up a platform in cooperation with the Chinese customers. “KJT.com” has designed an efficient logistics function taking advantage of the pre-payment function of the tariffs and the The Shanghai Free Trade Zone (SFTZ), providing a cross-border E-Commerce mall in compliance with various laws and regulations. transcosmos has tied a strategic partnership with “KJT.com” in order to realize a shopping environment which would further satisfy the Chinese consumers. transcosmos provides global E-Commerce one-stop service to deliver its corporate clients’ excellent products and services to the consumers in 36 countries all over the world. It will further accelerate its business development in the cross-border E-Commerce market going through significant changes and expansion. transcosmos launched operations in 1966. Since then we have combined superior “human resources” with up-to-date “technological” capabilities to enhance the competitive strength of our clients by providing them with superior and valuable services. transcosmos currently offers Cost Reduction Services (Contact Center, HR/Financial/Sales Back Office, Order Management/SCM, System Development/Management etc.) and Sales Expansion Services (Big Data Analysis, Internet Advertising, Website Construction/Management, Smartphone/SNS Utilization, Telemarketing etc.). transcosmos continues to pursue operational excellence by providing these services through our 156 locations in 26 countries with a focus in Asia. Furthermore, following the expansion of E-Commerce market on the global scale, transcosmos provides a comprehensive, one-stop global E-Commerce service to deliver our clients’ excellent products and services to consumers in 36 countries. transcosmos aims to be the “Global BPO Partner” of our clients to provide them with high quality BPO services on a global scale.